This is a work in progress: I tried to build Navit svn for my Nokia n810 using the OpenEmbedded cross-compile environment, just like I did for my Ångström. Navit now fully works but there are a few things left to be 'optimised'. It is by no means perfect or complete but shows my progress at this time (february/march 2009) with the issues needing attention. Maybe, by the time you reed this, the issues I found are already fixed, or new ones popped up. Feedback is welcome. 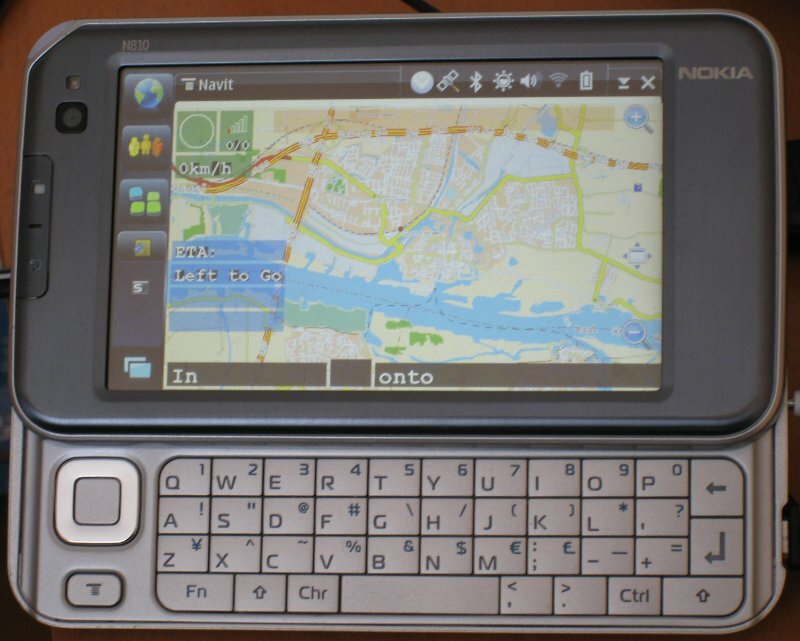 The n810 is running OS2008. My PC is running Fedora 10 on AMD x86_64. I got a considerable amount of tips from gerritv from #navit on freenode while getting navit to work well on n810. Thanks! Do get bitbake bitbake 1.8.12. See my build/conf/local.conf near the bottom of this page. In org.openembedded.dev/packages/navit/navit.inc you can remove the EXTRA_OECONF line. My org.openembedded.dev/packages/navit/navit_svn.bb is near the bottom of this page. As you can see there, the build uses libosso and libhildon so the + and - on top of device should zoom in or out; also gps should start automatically when we link libgpsbt and libgpsmgr. We build navit with gpsd-2.30 to get libgps15 which is deliverd by osso-gpsd-1.0 on the n810. When the bitbake build is ready, go to the chinook-compat-tmp/deploy/deb/armv6 directory to find your packages. We edit control.tar.gz in the navit_*.deb to remove dependency info about libgobject-2.0-0, libgmodule-2.0-0 and libgthread-2.0-0 which are all on the system but dpkg doesn't know about. Also we change the dependency for libgps17 into osso-gpsd. Description: Navit is a car navigation system with routing engine. Install and configure this reassembled deb as described (see Configuration). E.g. try the Internal GUI for a graphical menu, fullscreen map, OSD, POI, etc. Specific tips for configuring navit for n8x0/n770 can be found here. * Stolen form Cryptographic API. To build gpsd 2.30 you need this patch. See the bug report about libgpsmgr and libgpsbt. The libgpsbt issue is the biggest problem to fix. Currently navit works but the workaround to get there is ugly. configure should detect the libgpsbt package automagically. I need a little help here; perhaps the .pc file is the solution? You might want to go to this site and fetch the meta-maemo git tree. In there you'll find a recipe for a more recent libhildon. Copy the bb file into the maemo4 package directory of org.embedded.dev and adjust the version number in chinook-compat.conf. if you're on Nokia n8x0. This wrapper has been obsoleted by svn 2088. Just add "--with-svg2png-use-rsvg-convert" to the configure options to use rsvg directly. EXTRA_AUTORECONF = " -I m4"
DEPENDS = "gtk+ libglade libosso libhildon libgpsbt libgpsmgr"
This patch is necessary because during the configure stage libgpsbt isn't detected for some reason.